African Ruby (Pear), Multi Gem Stone and Diamond Necklace (Size 18) in Platinum Overlay with Green Plating Sterling Silver 17.500 Ct, Silver wt 24.89 Gms. African Ruby (Oct), Natural Cambodian Zircon Pendant With Chain in Platinum Overlay Sterling Silver 11.000 Ct. Designer Inspired-African Ruby (Rnd) Circle Pendant With Chain in Platinum Overlay Sterling Silver 3.500 Ct, Silver wt 6.37 Gms. RACHEL GALLEY African Ruby (Rnd) Lattice Pendant with Chain (Size 30) in Platinum Overlay Sterling Silver 1.440 Ct, Silver wt 12.96 Gms. Tracing your collarbones, a necklace is a beautiful accessory capturing attention towards a woman’s sensuous neck. Add an element of red with the ‘King of precious stones’ or ‘leader of gems’ – Ruby to further elevate the appeal. Ruby, with its bright red hues and exceptional qualities is among the most coveted gemstones known to mankind. Also, the birthstone for the month of July, Ruby is the stone of love, passion and energy filling the wearer with courage and strength while guarding against evil. 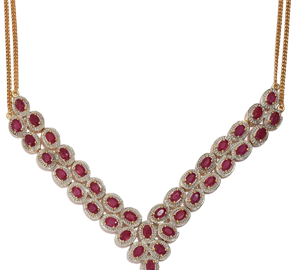 Ruby donned around the neck in the form of a necklace or a pendant has been in existence across cultures of the world. Diamond may be a woman’s best friend but it is the beauty of this fiery red stone that makes it one of the most desired gems by the women of UK today. For our prized customers in UK, TJC brings in a select aggregation of Ruby necklaces handcrafted by our skilled artisans as beaded strands or casted in precious metals – silver and gold. Ruby’s hues range from pink to blood-red and our beaded Ruby Zoisite Necklaces beautifully feature the whole spectrum; wear them to accentuate your day look or put them on to pep-up casual evening attire. To add a hint of luxury to your formal attire, we have designed a series of necklaces sporting the desirable African and Burmese Rubies. Rubies make the perfect gift for the special women in your life for they ward off evil and signify love; choose a Ruby heart necklace to express your affection with utmost grace and ease. It is also the stone for 40th marriage anniversary, and nothing makes a better gift than a Ruby and Diamond Necklaces from TJC’s collection. Radiating lustre from every cut, there is nothing more alluring than the deep red stone glistening on your throat; pick a piece that suits your taste and persona today. Ruby necklaces from our collection will speak volumes about your style; put them on and let the world admire your beauty from a distance.